What's so special? The focus; Being part of the whole; The collection; Getting physical; Getting organised; Service; Getting help; Refocusing. 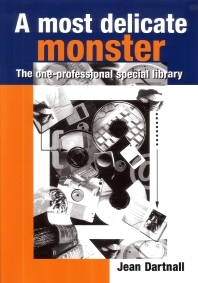 A Most Delicate Monster will be particularly useful for practitioners. The focus is on the running of small special libraries and particularly the one-person library. A professional outlook is maintained without neglecting the full range of tasks required in a one-person library. The practical orientation is supported by the use of checklists. Although the book is written with special librarians in mind, others will find it useful, especially solo librarians.